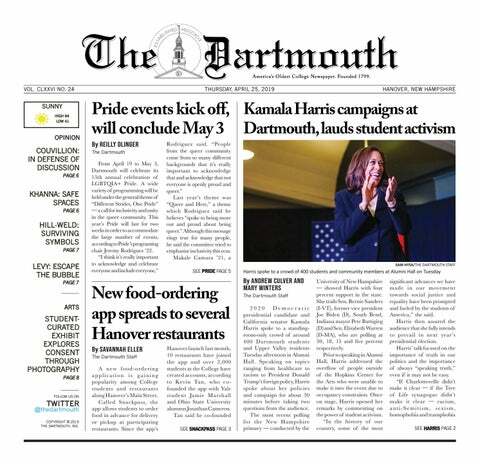 Since we’re Dartmouth students, we have some eccentricities involved in our efforts towards truly optimizing our dining experiences. Soon enough, you, too, will be successfully ordering a “barbeque tender queso” with pride. Here’s all you need to know to have the best first meal at your new home away from home. First, the basics. There are a few main dining areas on campus that you will soon familiarize yourself with: The Class of 1953 Commons, Collis Café, The Courtyard Café at the Hopkins Center, and King Arthur Flour. However, no one is ever that formal when referring to them, so you’ll get to know them as Foco, Collis, the Hop, and KAF, respectively. Foco is quite straightforward to navigate. As a first-term freshman, you’ll be assigned “The Ivy Standard” meal plan, which provides a swipe during each meal period . Foco is a great place to use meal swipes. During my freshman fall, using up all my meal swipes each week became a game that I had to win, and Foco prevailed as my trusty go-to when I had a few extra swipes to spend. A swipe into Foco is a swipe into a seemingly endless all-you-can eat buffet and, if you’re not mindful, a delicious gateway to the Freshman 15. As a vegetarian, Varsha Iyer ’21 frequents Foco often and has mastered the tricky yet tasty art form that is Dartmouth’s vegetarian cuisine. Right around the corner of Foco is Collis, which is hailed as the official student center and also offers some of our staple food groups: mozzarella sticks, smoothies, and stir fry. Collis Pasta is a classic dinner and my personal favorite Dartmouth meal. Pro tips? Come right when the pasta bar opens to avoid the line, stuff your bowl with your favorite veggies from the salad bar (add some kale for good measure, you won’t even be able to taste it! ), and ask the friendly chefs behind the counter for two scoops of your favorite pasta and sauce (tri-color for me, whole wheat if that’s more your speed). Then, be sure to stop by the condiment bar to further amplify your pasta with some grated parmesan cheese and red pepper flakes. The Hop is another multifunctional spot. Here, you can watch an a cappella showcase at the auditorium and then head on over a few feet to the Courtyard Café, which is our go-to place for warm comfort food. But, beware, ordering food at the Hop usually means that you have a spare minute (or thirty) to spend waiting in line, especially during peak hours. However, with handcrafted and cooked-to-order meals such as specialty burgers, chicken quesadillas, and grilled cheese, the wait is definitely worth it. Due to our habit of nicknaming everything, ordering here may seem a little intimidating at first, but the workers at the Hop are some of the nicest people on campus. You will learn to love their distinctive lingo, which includes terms like “queso” (quesadilla) and “mozz sticks” (mozzarella sticks). Often seen joking around with the staff, Ashley Francisco ’21 is a Hop regular and advises people to make the most of their ordering experience. One of the Hop’s hidden gems? Its new salad bar. Come here if you want a lighter option and choose from their pre-made selections or even make your own! But ensure that you have enough DBA to spend before you tack on some fruit to that healthy post-gym meal. And finally, nestled in a nook of Baker-Berry Library is the last dining area on our list, KAF, which is renowned for its coffee and pastries. Though not affiliated with DDS, KAF might be one of the most popular dining options on campus, evidenced by the lines that extend far out into the hallways of the library. KAF does not accept meal swipes, so pay for things here with DBA. Some iconic drinks include chocolate milk with a shot of espresso, iced chai, and cider. KAF also has a daily drink special, which is usually cheaper and made with fun flavor shots. Overall, with its prime location and tasty treats, KAF is the perfect way to cure that mid-afternoon study slump. So, as you can now see, figuring out what to eat should be the least of your worries in your transition to college. We have more food here (and even more ways of ordering said food) than you could ever imagine. Stay hungry, Dartmouth.